That funky dude? That’s Ganesh. We’ll get to him. Yesterday afternoon I went for a run. I was horrified when I realized I had forgotten my ipod at home and thus had no way of blocking out my thoughts on my run…and I have been having A LOT of thoughts lately. So many that I cannot stand to be in my head - and that is with all the yoga and mind calming exercises. I left for the run regardless and set out on my normal route – the loop that can be 3.5 miles with multiple hills and 4 miles with only one hill. At the top of the first hill, instead of continuing straight, which leads me to the normal routes, I took a left. I took the left with the intent of turning back. I was already walking by the time I reached the top of the hill and hating my hamstrings and my head, in no particular order. I started running again at some point and was delighted to see that I had picked a cracked, root-lifted, falling apart sidewalk to run on. I am not being sarcastic – when I don’t have my head in the run, I like to be distracted by difficult terrain – whether that be sidewalks filled with people, roads with tons of cars and no sidewalks or crappy terrain - it keeps me entertained and makes the miles go by faster. I chose an obstacle ridden path. On purpose. For fun. Obstacles are not always a bad thing. They force us to re-negotiate our path, to try harder or to change course completely. Outside of running, I have come up against some serious obstacles in my life recently. All of which I have created myself. These obstacles are the result of deliberate choices I have made which may have been right at the time but which now are obstacles waiting to be conquered…or not. After my run yesterday I was reading this article about Ganesh. He is the bringer or taker of obstacles. I need Ganesh badly – the taker of obstacles Ganesh, preferably. Though I know that after these current obstacles are conquered or taken away, more will come to be in their place. That is totally okay – obstacles force us to re-evaluate, to make decisions and to grow. 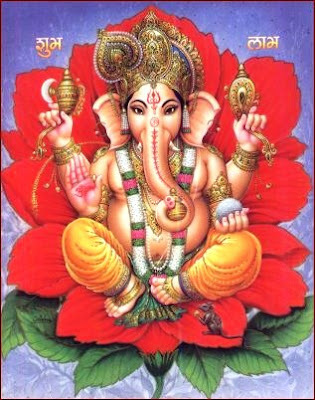 I hope Ganesh touches your lives as well, to help you grow where stagnant by putting obstacles in your way and by taking away those obstacles that are no longer necessary. I totally agree about the obstacles being a good thing. As the Dead once sang "when life feels like easy street, there is danger at your door".